Although Cambodia is a small country, it’s packed with exciting and unique destinations. Our 14 day Cambodia itinerary lets you explore the country in-depth, from the temples of Angkor to the calm beaches of Sihanoukville. Below, we’ve put together a two-week travel itinerary for Cambodia covering all of the country’s highlights, as well as a few off-the-beaten-path destinations that most tourists never have time to see. Note: Have you worked out your budget for Cambodia yet? 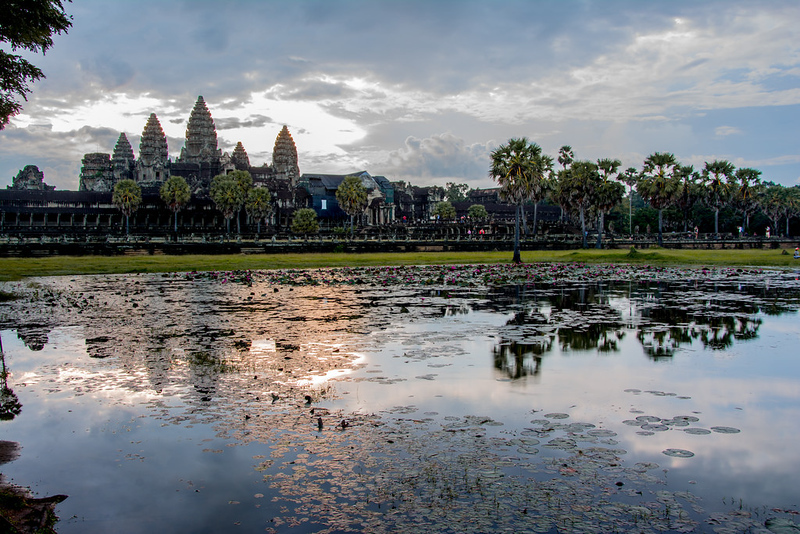 Our guide, How Much Money Do I Need For Cambodia?, explains how much you’ll need to budget while you’re in Cambodia, with up-to-date costs for things like accommodation, transport, food, drinks and more. You’ll start your trip in Cambodia’s bustling capital of Phnom Penh. 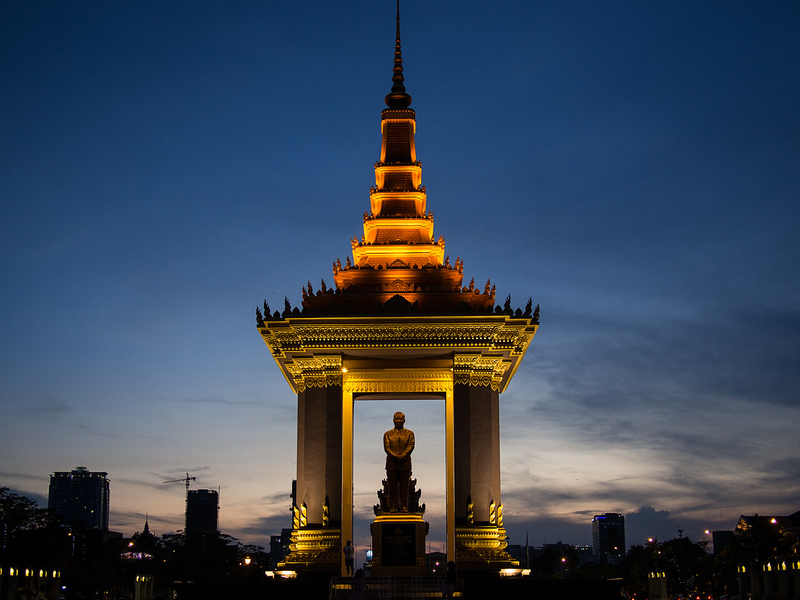 With an international airport, Phnom Penh is easy to reach from nearby regional centres like Singapore and Bangkok. From the airport, it takes 20 to 30 minutes to get into Phnom Penh and to your hotel. Phnom Penh is a fairly small city with only a few districts of interest to tourists. You’ll find most of the city’s accommodation around Sisowath Boulevard — a long street that runs alongside the Tonlé Sap River — and the upmarket BKK1 neighbourhood. Need help finding your way around Phnom Penh? Our Phnom Penh Quick Guide lists the city’s top hotels, restaurants, cafes, cultural attractions and more. 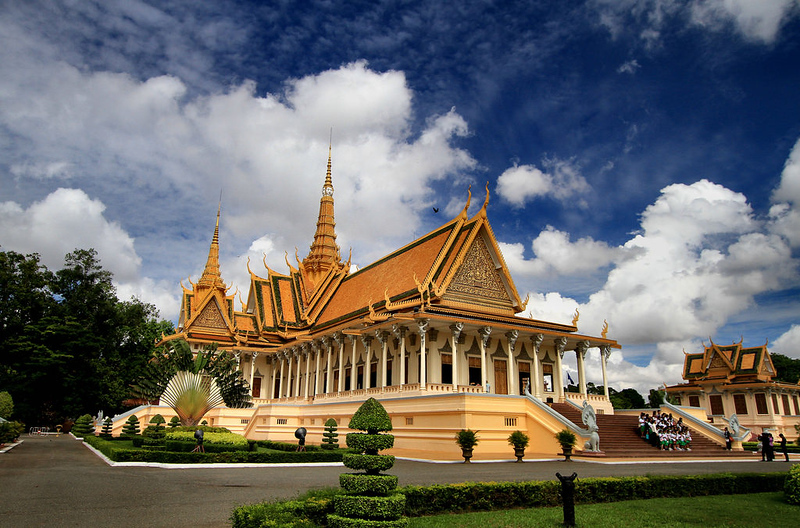 Phnom Penh has a large variety of attractions for travellers, ranging from the stunning beautiful Royal Palace to the sad Tuol Sleng Genocide Museum. We’ve listed four must-see attractions in Phnom Penh below, which can be visited over the course of two days. Built in the 1860s for the Cambodian Royal Family, the Royal Palace is a large complex of buildings near Sisowath Quay that should be your first destination in the city. Once a high school, Tuol Sleng Genocide Museum was used as a prison camp during the Khmer Rouge era and today houses exhibits about the country’s violent past. About 30 minutes from Phnom Penh, the Killing Fields at Choeung Ek are a reminder of Cambodia’s civil war and the terror of the Khmer Rouge period. Phnom Penh’s Art Deco Central Market is a great place to shop for cheap clothing and souvenirs. Our Phnom Penh Quick Guide contains more information about the best things to see and do in Phnom Penh, from tourist attractions to restaurants and bars. After three days in Phnom Penh, it’s time head to the beach. Sihanoukville is Cambodia’s most popular beach town, offering a selection of quiet and peaceful beaches and serving as the main gateway to the beautiful island of Koh Rong. The easiest way to get to Sihanoukville is by minibus. Giant Ibis and Mey Hong Transport both offer direct minibus transport between Phnom Penh and Sihanoukville. The first buses leave at 8am and reach Sihanoukville shortly before midday in normal traffic. Need help finding a place to stay in Sihanoukville? View the city’s best hotels and guesthouses in our Sihanoukville Quick Guide. 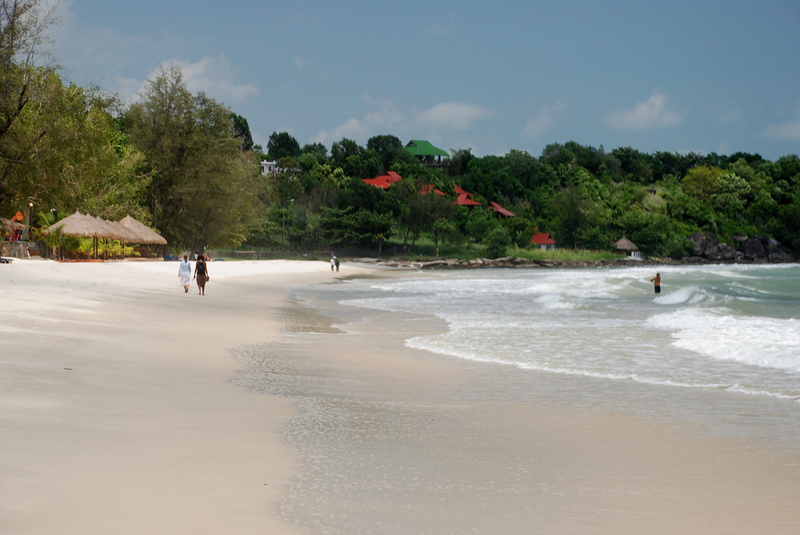 Sihanoukville’s beaches range from noisy and crowded to quiet, beautiful and almost completely free of mass tourism. Our Sihanoukville Quick Guide lists five of Sihanoukville’s best beaches to visit, as well as the top things to do in and around the city. If you’re seeking more peace and quiet than what’s available in Sihanoukville, take the ferry to Koh Rong. With white sand beaches and stunningly beautiful water, Koh Rong is Cambodia’s second largest island and one of its most relaxing destinations. Siem Reap is a small city in northwestern Cambodia famous for its close proximity to Angkor. As the closest major settlement to Angkor Archaeological Park, Siem Reap is a convenient base for exploring Cambodia’s incredible ancient temples and historical sites. 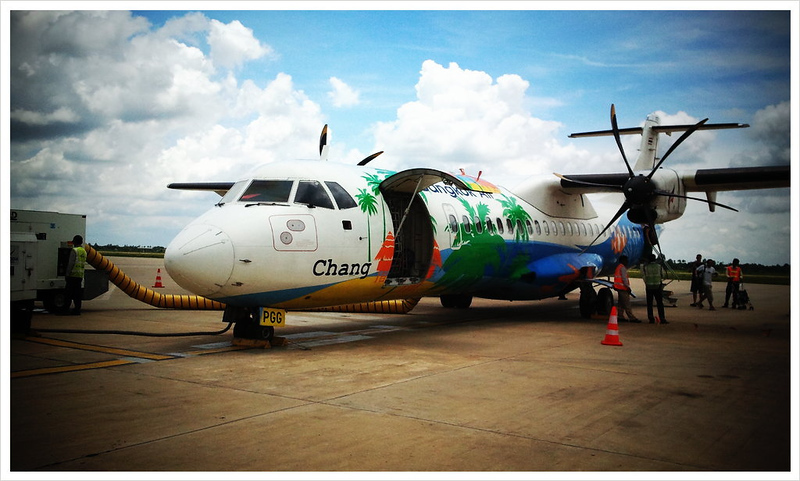 Flights between Sihanoukville and Siem Reap are available on Cambodia Angkor Air. It’s also possible to travel between the two cities by night bus, although it’s a long 10+ hour trip through Phnom Penh and onward to Siem Reap on National Highway 6. Siem Reap itself is a small city with a variety of interesting attractions. Our Siem Reap Quick Guide lists the city’s top luxury, mid-range and budget hotels, as well as the best places to eat and drink in Siem Reap. Located just outside Siem Reap, Angkor Archaeological Park is Cambodia’s most famous tourist attraction and by far the biggest draw for most tourists visiting Siem Reap. The park is massive, covering over 400 square kilometres and attracting more than two million visitors every year. By far the easiest way to see Angkor Archaeological Park is by tuk-tuk or private taxi. 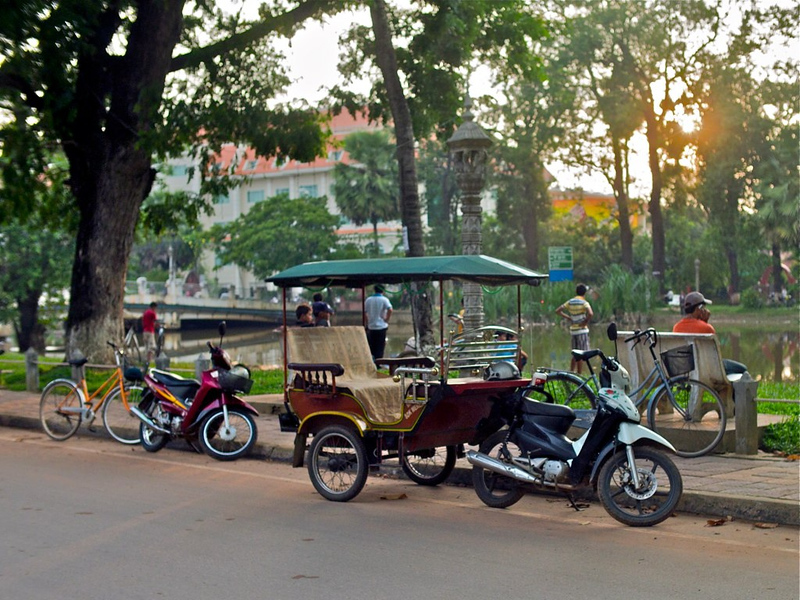 Tuk-tuks are available from Siem Reap and cost $12 to $15 per day. If you plan on taking several days to see the park and want to visit some of the more remote temples, it’s better to hire a taxi. The main highlights of Angkor Archaeological Park can be visited in a single day. However, if you’re at all interested in Southeast Asian history or archaeology and want to see some of the park’s remote and hidden temples, you’ll get a lot out of a two or three-day visit. Arrange for your tuk-tuk driver to take you to the park as early as possible. The park is open from 5am, with one-day passes priced at $20 per person. 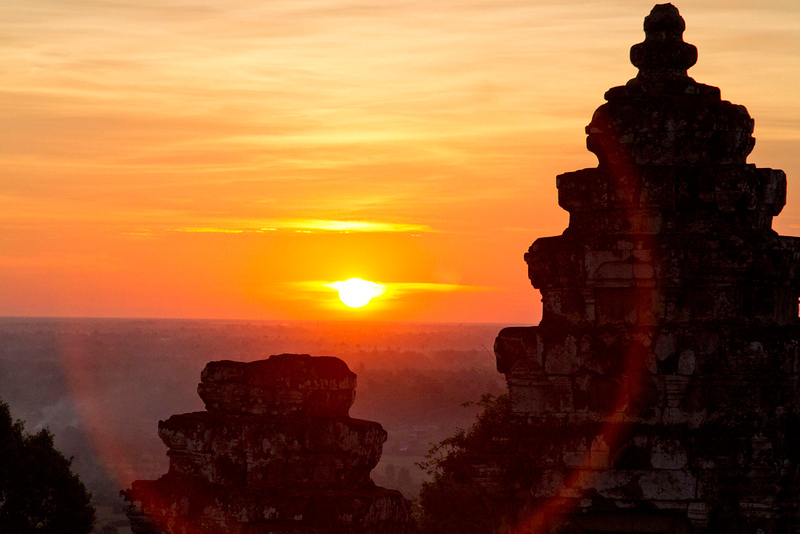 Get to the park before dawn and you’ll be able to watch the sunrise over Angkor Wat before exploring. The first stop is Angkor Wat. Wait until after sunrise to explore the temple, as there’s no artificial lighting inside and there are plenty of sharp corners and sudden drops. Angkor Wat is a huge temple that deserves an hour of exploring. After Angkor Wat, ask your tuk-tuk driver to take you to Angkor Thom. Here, you’ll find a stunning 12th century Mahayana Buddhist temple called the Bayon, which features large smiling face sculptures. Travel across the other moat from Angkor Thom and stop at Takeo. This is a five-level temple built in the shape of a pyramid that reached 40 metres into the air. It’s one of the only temples in Angkor Archaeological Park built using large sandstone blocks. From Takeo, ask your tuk-tuk driver to continue down the road to Ta Prohm. One of the most photographed temples inside the park, Ta Prohm has been preserved in the state that it was discovered in decades ago, with roots and trees extruding from the temple. Angkor Archeological Park is open until 6pm during the low season, and until 6:30pm in the high season. If you’ve got at least three hours to spare before the park closes and want to see more, try the remaining two temples in our Guide to Angkor’s Essential Temples. Spending two days exploring Angkor Archaeological Park is a great way to see more than just the highlights of the park without covering too much ground. On your second day, you’ll be able to visit the archaeological site of Kbal Spean and the red sandstone temple of Banteay Srei. If you plan on spending two days exploring Angkor, purchase a three-day pass when you enter the park (priced at $40), which gives you the chance to extend your visit if you decide to spend an extra day exploring some of the park’s more remote temples. One of Angkor’s older temples, Banteay Srei is a 10th century sandstone temple in the north of the archaeological area, about 25 kilometres from Angkor Wat. Banteay Srei is a shrine to Hindu god Shiva and one of the park’s most popular remote temples. With a similar design to Angkor Wat, Banteay Samre is a restored temple located to the east of the now-dry East Baray. Painstakingly restored using the anastylosis method, it has some of the most intricate and complete carvings of any temple in the park. Located deep in the jungle to the northeast of Angkor Wat, Kbal Spean is an intricately carved riverbed that’s one of Angkor’s best hidden sites. The carvings are located at the end of a two kilometre uphill trail that passes through some of the area’s dense jungle. If you really want to experience Angkor, spending three days exploring the park is a great way to see temples that most tourists never experienced. Below are two remote groups of temples that are perfect for filling your third day of visiting Angkor. Located on National Highway 6, the Roluos Group of temples contains three of Angkor’s oldest structures. Bakong, Lolei, Preah Ko were among the first temples to be built in the Khmer capital of Hariharalaya from 879 to 893 AD. Beng Mealea is an incredible temple located 40 kilometres east of Angkor Wat. Almost completely unmaintained, the temple has been left to nature and is partially collapsed, with piles of large stone blocks littered around the site. If you only spend one or two days exploring Angkor, taking an overnight trip to Battambang is a great way to end your trip to Cambodia. Famous for its Buddhist temples and colonial buildings, Battambang is a quiet city that’s accessible by boat from Siem Reap. By far the best way to travel to Battambang is by boat. One boat leaves Siem Reap every day and reaches Battambang four to 10 hours later, depending on the water level. The trip is slow but enjoyable, passing through rural Cambodia and by a variety of scenic fishing villages. Highlights of Battambang include the Governor’s Residence, which was built in the early 1900s for the Thai regional governor, Battambang Museum, Phnom Sampeau and Wat Banan. Small and quiet, Battambang is easy to explore on foot or by bicycle. After one or two nights in Battambang, head back to Siem Reap by boat or minibus. Siem Reap has a good variety of attractions and day trips, making it a fun place to spend your last few days in Cambodia before flying back home. For a somewhat touristy look at lakeside life in Cambodia, visit Kompong Phluk Floating Village. The village is located on Tonle Sap — a huge lake near Siem Reap with a water level that varies massively between the wet and dry seasons. For a look into the long-term consequences of Cambodia’s destructive civil war, visit the Siem Reap Landmine Museum, which documents the results of millions of landmines that were places throughout Cambodia in the 1970s. For a great view of Siem Reap, Angkor and Tonle Sap, visit Phnom Kron — a 140 metre hill with an impressive hilltop temple that has one of the best views of Tonle Sap in the region. Siem Reap International Airport is Cambodia’s busiest airport. If you’re flying back to Bangkok, Singapore or other regional centres to catch a connecting flight, you’ll easily be able to do so from here. Otherwise, frequent flights are available between Siem Reap and Phnom Penh. Start Planning Your Cambodia Trip Now! :: Find available places to stay on Booking.com - usually you can reserve a room with no upfront payment. Pay when you check out. Free cancellations too. :: Find the cheapest flight with Skyscanner - one search will show you the prices and times from scores of airlines for your trip. A real timesaver. :: Book bus and domestic flight tickets in Cambodia with 12Go - easy to use website that lets you check timetables and buy tickets online. :: Need inspiration? Check our Cambodia Itineraries for ideas of where to go and what to do. 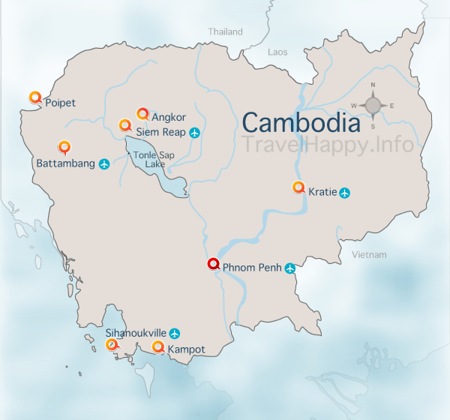 :: Explore our Cambodia Travel Guide for more Cambodia must-see destinations. Do I Need Travel Insurance For Cambodia?